Here is a Sleigh / Sled that came from Bodie, California / which is a historical Ghost Town and is a National Park. 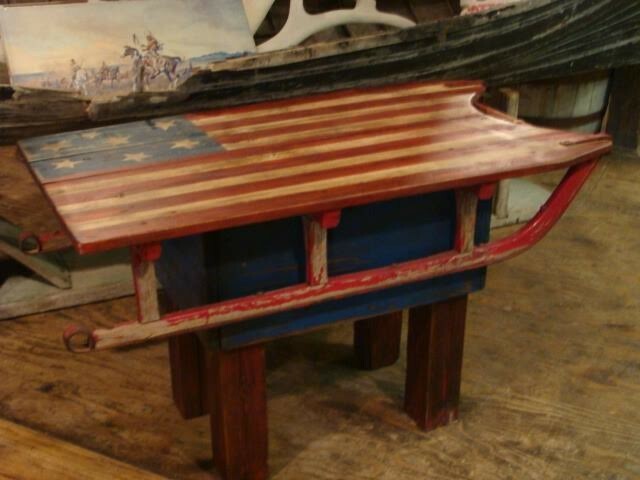 I built the legs and painted the base Red White and Blue and painted a Folk Art American Flag on the top. Making it a great piece of Art. Here is a Sleigh / Sled that came from Bodie, California / which is a historical Ghost Town and is a National Park. I built the legs and painted the base Red White and Blue and painted a Folk Art American Flag on the top. Making it a great piece of Art. Please email cowboycabin@centurytel.net with questions or call 406 270-2842.